So…I have said many times that I have much to learn about Hindu worship traditions. During my first 52 weeks, I avoided taking tours and classes, and focused on stepping into worship experiences and just trying to take it all in. I have decided recently, however, that I am going to go back to the HIndu temple I visited in Lemont, IL and take both a tour, and ask someone from the community to speak to me about the details of the Hindu religion. 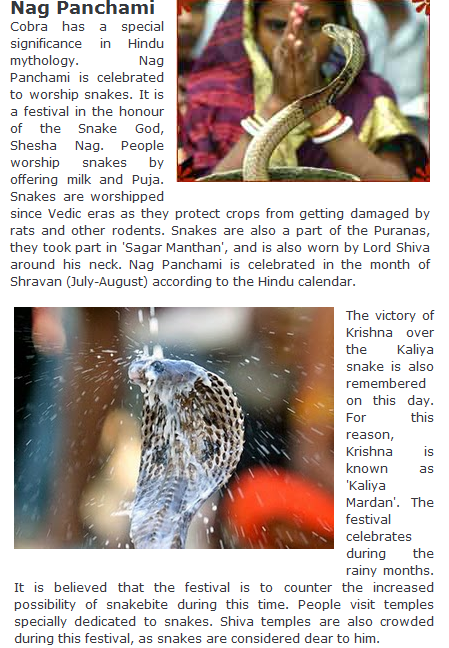 Anyway…this is an article about a Hindu festival, Nag Panchami, which is celebrated to worship snakes. Nag Panchami takes place on August 4, 2011. « Belief vs Action: Do Christians need a Ramadan?